All drawn out? Grab the bull by the horns. There is a phrase we hear often when faced with tackling a thorny problem and one that seemed very apposite for inclusion in this post. “You just have to grab the bull by the horns”. It’s not often I’m reluctant to pick up a pen or pencil and start scribbling but, this has very much been the case over the last few days. Returning home last week after a frantic three day stint of freelancing work, I can only describe my state as being “all drawn out”, bereft of any inclination to put pencil to paper. Why? Well, this particular bit of work involved creating about fifty separate drawings as part of a mammoth communication exercise at the early stage of a very large and complicated project. By the end of it I was done, the tanks would need refilling before another image left the end of my pen. The creative energy required for idea generation at times like this seems huge, but that doesn’t mean that there’s none there, just that less is available for a while. So this is a great time to reach for one of a number of pieces which are sitting comfortably in the “on-going” pile. Moving something along a bit, rather than needing to start afresh is, for me at least, a cunning way to grab the bull by the horns without expending too much effort, and get back into the swing of image creation after a bit of a lull. Making small adjustments and working up the level of detail are both important to the final outcome and are both things that one doesn’t need to rush, one can take ones time to think carefully about each change and work in a slower, more deliberate way. It is very satisfying. The main image at the top of todays post is such a work in progress and something I’ve been playing about with for quite some time. 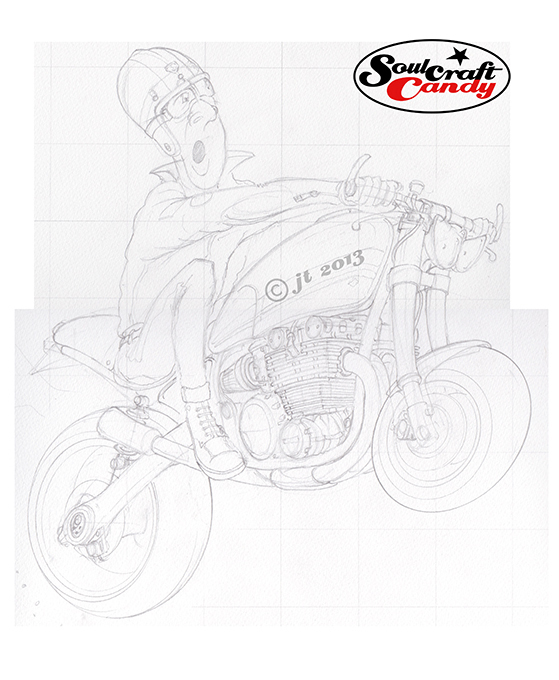 It started life as a very rough little sketch a couple of years ago and since then I’ve just tinkered with it. At first I thought it might make a good t-shirt design as in the version with the red gas tank, but never got far enough with it to confirm my suspicions. And then a few weeks ago I found it again and thought it might be better as a larger drawing in ink. 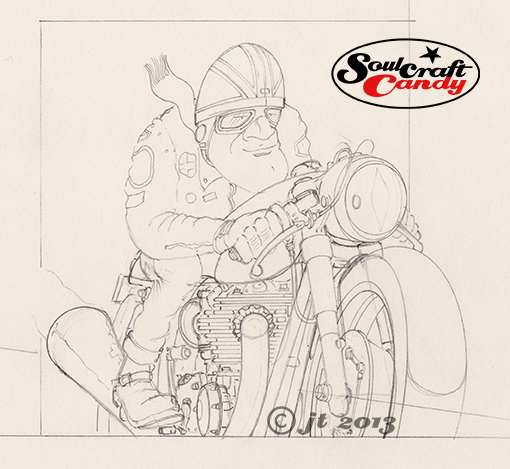 What you see is the latest pencil layout for that big drawing. The t-shirt idea isn’t dead, but by finalising the details on the bigger drawing I’ll be in a much better position to undertake a reductive exercise to create a better shirt design. That’s the thinking anyway, and co-incidentally this picture has a working title of “The Bull”. S’funny how it worked out like that eh? The sharing of pictures which are completed as gift commissions is always a little tricky. Firstly you need to wait until the gift has actually been given, and secondly as in this case, I was waiting for it to be published on a club website before picking up my small trumpet and giving it a blow. 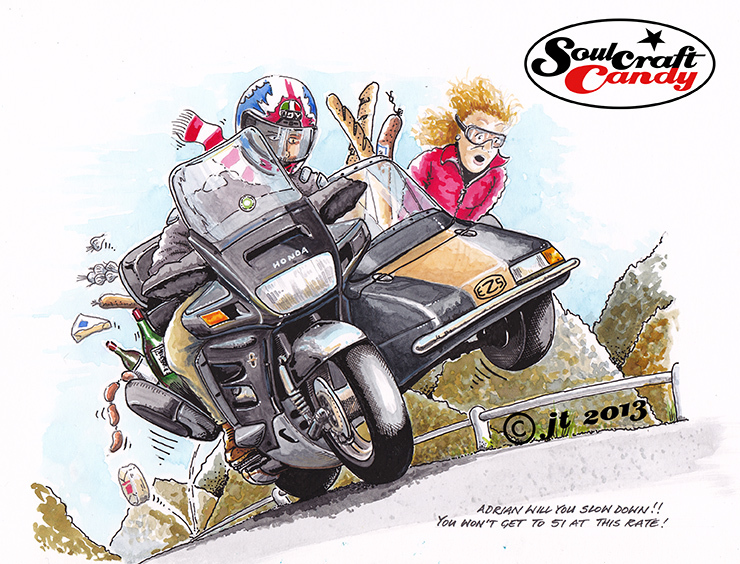 This depiction of slightly exuberant sidecar piloting was done for the brother in law of a very good and old friend of mine Ben, whose approaching 50th birthday required a special kind of gift. Adrian, the brother in law, is an ardent sidecar enthusiast and is setting out this summer on a european tour on his outfit with his wife Polly. Over a coffee with Ben, we agreed that a speeding outfit with fresh french produce bulging out of all available spaces would be particularly apt. When undertaking an exercise such as this I like to work from some decent reference material and Ben duly supplied me with some photographs of Adrian, Polly and the big Honda outfit. Whilst one doesn’t want to slavishly depict every detail exactly, a cartoon is an interpretive exercise after all, it’s good to have all the information available for feeding the distortional process which occurs when the pencil hits the paper. 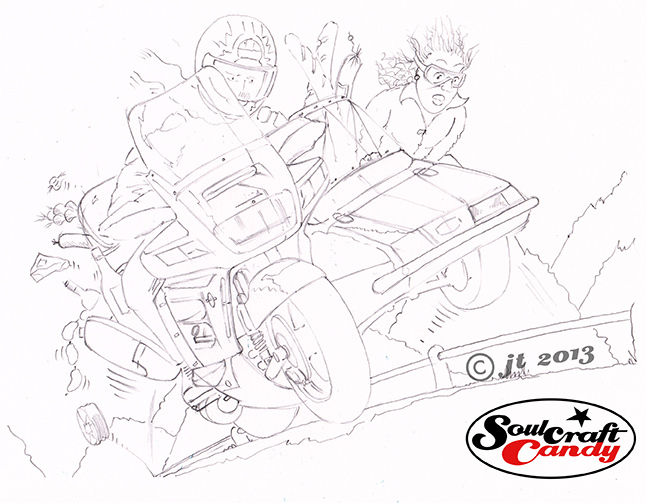 I’ll openly admit that my skill in creating facial likeness is not very good, a frequent obstacle in undertaking any commissions, but thankfully in this case I was rather saved by needing to show him riding and so with a helmet on his head. Background information really helps here too as you can pick up little things which you can include in the image which help to flesh out the character you’re trying to show, like the soccer team scarf and riding gear. 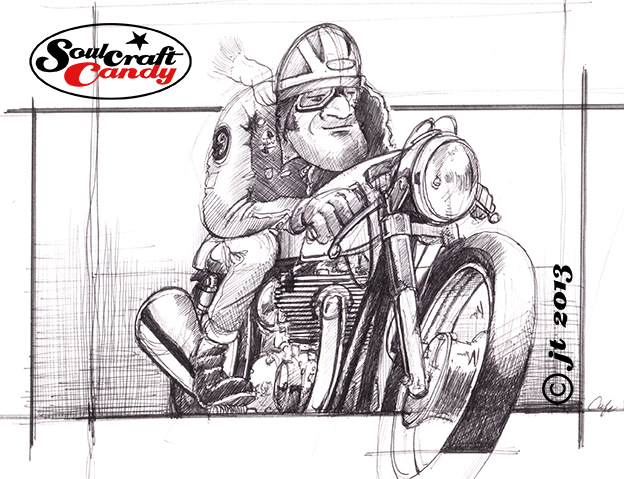 The pencil layout before applying the colour washes and ink. 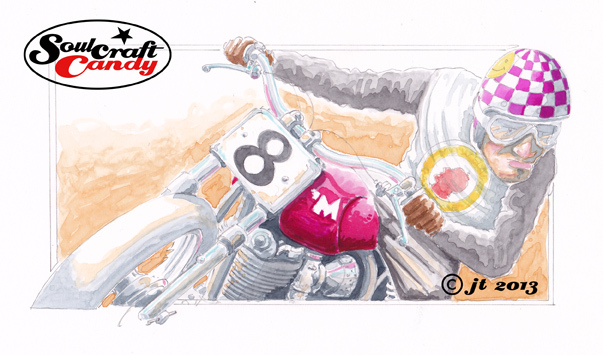 This one was drawn onto Bristol Board before being coloured with watercolour washes and then inked up using technical pens of various widths. I thought it came out really well and was thrilled to hear that Adrian was chuffed to receive such a unique gift. There always seems to be a kind of unintended lull between the end of one project and the commencement of the next. It’s a time of reflection yes, moments spent considering the quality of the recently finished work but, it’s also a period spent shuffling bits of paper around whilst ones butterfly mind flits from one thing to another in an attempt to decide on what to tackle next. I am coming to the end of one of these phases at present. Whilst every impression is given that this is somehow wasted time, much more has been happening in reality. 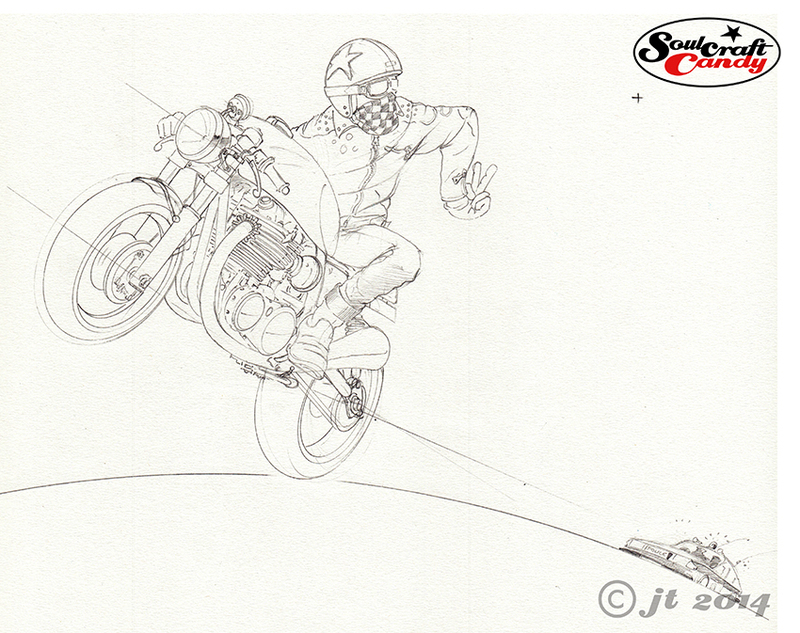 Previously I mentioned wanting to get the nine small colour Cafe Racer pictures made into cards. Well, I did and they turned out pretty well. Using an online printing service that did some business cards for me a while back, Moo.com, I elected to have a small batch printed. The advantage of services like this is that you can order very small print runs which keeps your financial exposure to a minimum as you test the water, as it were. I ordered twenty of each design, so twenty sets in total. 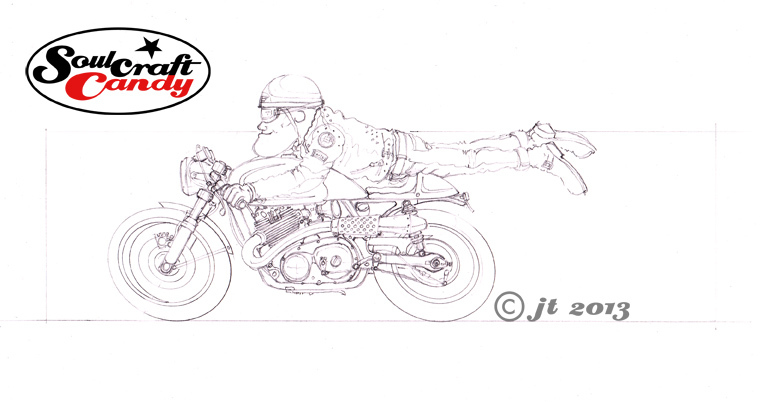 I also ordered twenty five each of three greetings cards based on the black and white biro drawings done last year. The intention is to try and sell them via the Soulcraftcandy store on Big Cartel. Well, that was the intention, and it still stands, though a good friend who’s starting up a bike building workshop and store has just taken virtually all of my stock off my hands, leaving me with a few greetings cards. However these will hit the store soon. Time has also been spent thinking a lot about making stuff, something I haven’t done for a while and need to do more of. There are some fresh t-shirts sitting here waiting for an introduction to some printed transfers of some of the drawings, just to see how they’ll come out and to spur me into developing some specific images for printing on shirts in the future. Two books from the library about working in precious metal clay sit on the shelf awaiting further investigation, though I have no idea if I possess any latent jewellery making ambitions, and I’ve been checking out the costs of various sheet metals because I’ve got some mad idea that it might be fun to try and draw on metal with a Dremel tool. 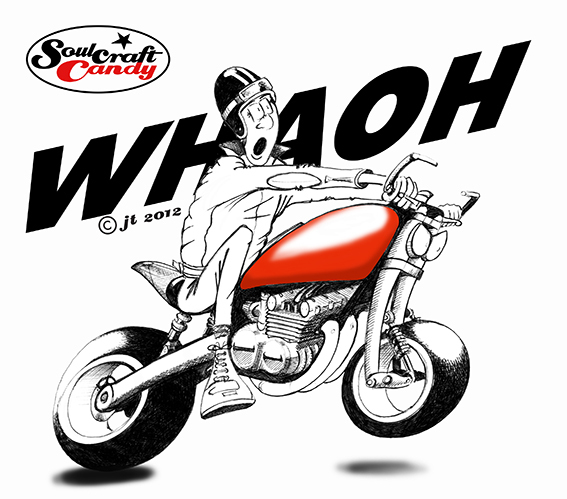 So, not much whizzing round the grey matter! To keep the hand and eye in shape, a couple of new drawings are about to start too, the first of which you’ll see here in rough sketch and tuned up pencil versions. I’ll try an ink and wash version, perhaps a biro one and, having just found an old dip pen in the drawer, perhaps an old fashioned inky thing. Time to get cracking. In the last post I talked about trying some news things and challenging myself to develop some new techniques and practices. It is hoped that this will inject something fresh into the drawing process, to keep the old brain stimulated and create some funky images along the way. Though probably a needless concern, it has always been important for me to ensure that I never get bored with what I’m doing, that it become repetitive to the point that I’m reluctant to engage with it, and above all, it should remain fun with a capital “F”. One of the best ways I’ve found to keep the fun factor going is to have a group of styles and techniques which I can swap between. Someone asked me not long ago wether I had a signature style and I found the question quite hard to answer, it made me go away and think about it. 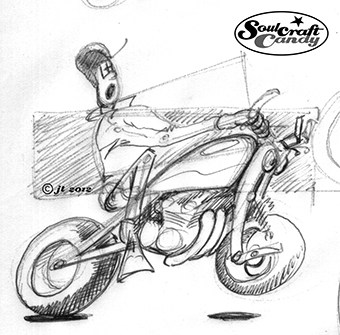 Eventually it occurred to me that I most likely, or literally, did not, but I did have a style in the way that I drew the subjects, how I represented basic forms and shapes. What caused the feeling of uncertainty in hearing the original question was that the way in which I subsequently rendered each image, be it in biro pen or coloured ink etc, could be very different, and so some final pictures vary greatly from others in their final look. There are probably those who would suggest that it’s important to develop a signature style but I prefer the variety that a group approach gives you. The point being that I believe it’s vital to keep interested in your work and never be afraid of the freedom experimentation affords you. Long may it last. So here’s the second picture in my quest for more productivity and fun. This image shows it half done. Here the basic pencil outline is gradually filled using very thin layers of watercolour and coloured ink. By building the image slowly it offers the opportunity for some interesting overlaying of the pigments, and varying the tone across the details. These are being done on Bristol Board which doesn’t behave anything like watercolour paper, it’s smooth and flat to start with, doesn’t buckle so you’ve no need to stretch it and the paint dries very quickly. I love my watercolours but endlessly waiting for bits to dry enough before applying the next colour without risking it all melding together can be a little trying at times. As I said this is a relatively quick way to do it. Once I’m happy that I’ve got most of the colour down, the whole thing is redrawn in ink. I’ll show the final inked up picture in the next post. The long weekend away turned into a longer period away from the drawing board thanks to another chunk of freelance work, a mad dash to the line in time for a client meeting abroad for my client and a hefty chunk of mechanism making. It worked out fine so here’s hoping more work from them soon. Anyone who has a home workshop full of stuff, or a home studio full of the products of ones creativity will know that it is an oft occurring feature of life that whilst rummaging through things in order to find a particular item, one often uncovers another item long buried under a pile, or secreted at the bottom of a rarely opened box. It happens on our computers too. How many of us have hard drives stuffed with old files we barely know we still have? So it was a nice surprise to unearth some very old drawings from my first year as an art student. You’ll see that my interest in engines was already in plain view. As some of you will know, and others perhaps not, ones journey toward a creative life in the UK often starts after you’ve spent eighteen or so years filling your head with maths, history, geography, languages and all manner of fact based academic luggage. Many of us don’t really know what creative career we would like to pursue and so a year on a Foundation course helps to point you in the right direction. It’s a fantastic period full of experimentation and exploration as you feel your way through a vast gamut of disciplines. After thirty years as a professional I really feel like doing another one it’s such an expansive experience. So these two drawings are from that time, products of one of the many observational drawing assignments undertaken where the emphasis was on producing lots of images rather than how one made them. The one above is done in soft pencil on cartridge paper and is complete with smears, fingerprints and the lovely grubbiness one gets from the heel of your hand moving about the paper. I’m not sure, but I think the lower one is done in some kind of oil pastel, again on cartridge paper, and is vastly oversized. You can see from both that my interpretation and understanding of forms, and the ability to distinguish surfaces through light and dark areas is starting to assert itself but is very much a work in progress. I’m particularly amused by my rendering of various ellipses, a geometric shape that haunts many an interpretation of man made objects. I still struggle with them even now. What is this object? 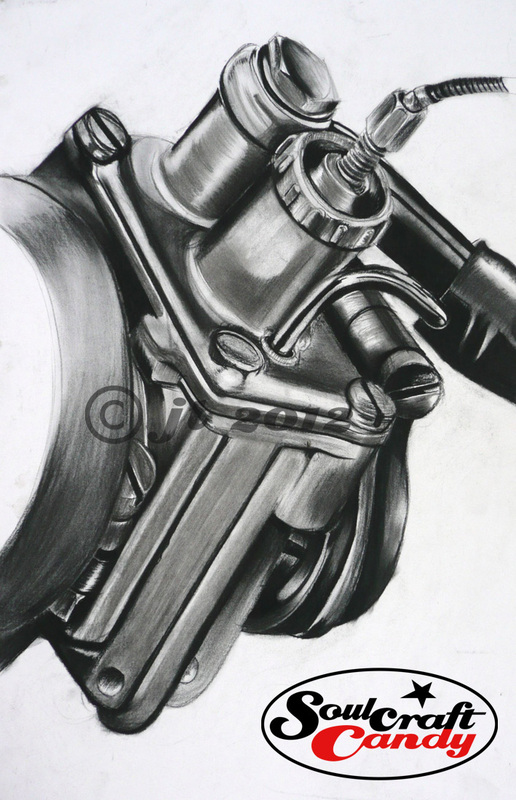 It is a small engine that one attaches to the rear seat stays of a bicycle and drives the rear wheel via a roller lowered onto the tyre. A Cyclomotor perhaps? In the larger image it is upside down, the cylinder would point downwards in normal use. My uncle appeared from his cavernous garage with it on the day I mentioned to him that I was looking for something unusual to draw. 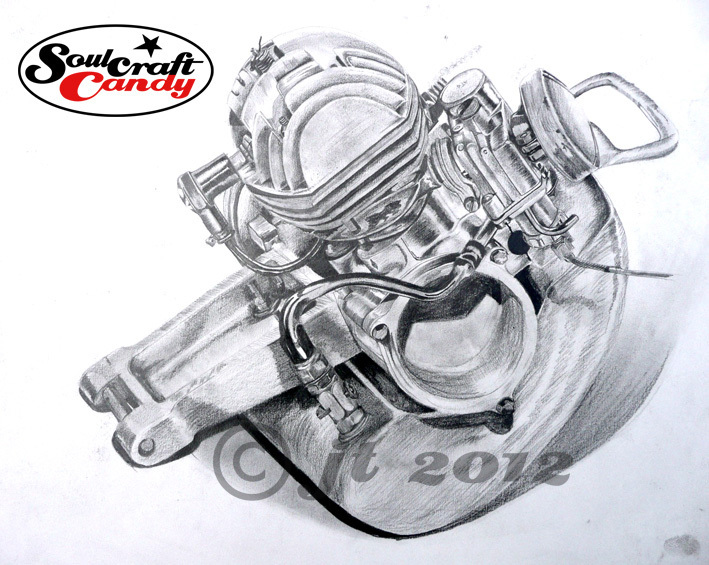 Sadly I can’t remember what happened to the motor or the drawings after I photographed them.